Starting to feel like summer in Daejeon which means summer is just around the corner and the return of the Korean maemi (cicada). They are noisy little critters. When it comes to how some apartments and homes are designed and constructed in Korea, it’s the little attention to details that means everything. Like installing a showerhead above an electrical outlet in the bathroom. Well, at least there’s a cover on it. Okay, okay so I am nitpicking a little. I really love my new apartment a lot. Like I said, it is one of the better apartments I have lived in Korea. 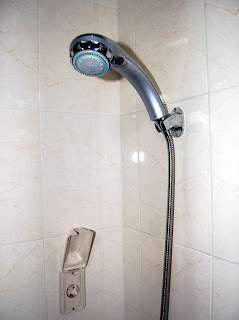 However, after a day or two you begin to notice things—like this showerhead in the bathroom. But you know, I am wondering if this outlet was supposed to be on “the other side of the wall” in the kitchen because there are no electrical outlets in the kitchen at all. Where does one plug in the rice cooker or coffee maker? You have this great counter space, but no outlets. Hmm…I wonder if someone read the blueprints the wrong way?